SKA, RETRO-rock, songs in Irish and English, all recorded in a former pub by a group whose members hail from several Irish counties and one of the English home counties, who take their name from the gangster played by George Raft in Some Like It Hot - it can only be Spats Colombo. Spats Colombo launch their debut EP, Caught In A Bind, at the An Ait Eile: What Now? cultural weekender festival in the Galway Arts Centre, Dominick Street, on Sunday October 9. 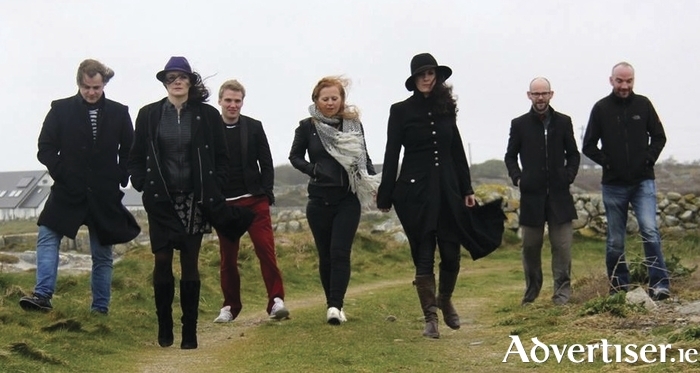 The band - Simon Noble (vocals/guitar ), Caroline Ní Dhubhchóin (vocals ), Michael Carey (violin/vocals ), Gráinne Bleasdale (vocals/piano ), Brendan Feeney (bass ), Colmán Mac Séalaigh (drums ), Seán Reynolds (guitar ) - mix alternative rock with contemporary folk. Its members hail from Oxford, Donegal, Connemara, Dublin, and Cork, but all are resident in Galway. "We see ourselves more of a collective than a band," Simon Noble tells me. "Being in a band is hard. You have different timetables leading to varying degrees of availability for the members in the group." Easing the pressure on the group is that they have their own studio in Connemara, built by Simon and Sean Reynolds. "The building was a pub up until last year," says Simon. "It is situated in the middle of a field, making it an ideal location to make noise, both loud and soft. The studio has been able to make the recording process a lot simpler. There are no time restraints, we can leave our gear set up and come and go as we please. Caught In A Bind was recorded over five months, which averages a month a track, so not bad going!" Simon explains how the key approach to recording this EP was that it should "blend what we think are the unique characteristics of Spats Colombo into the five songs". He credits Sean Reynolds with being vital to this realisation. "Sean recorded and produced the record," says Simon. "It was important we left him to it. I am the main songwriter and have been guilty in the past of dominating recording sessions, resulting in a record which sounds like I want it to, as opposed to a collective contribution. Sean has been excellent in attaining what the songs need as far as instrumentation and singing goes." The EP incorporates pop, folk, Gypsy, ska, and retro rock. "Lyrically the songs sway from tales of male and female indiscretions to thoughts of death, from being so alone, to looking at someone and feeling you will never be alone again," says Simon. "We’ve got some brass on the record and some wonderful strings. With five members of the group having Irish as their first language, it was important to us the language was represented in the vocals. So one and a half of the songs are sung in Irish." The EP is available to buy from iTunes and Amazon. It can be streamed via Spotify and Soundcloud. Physical copies will be available "along with quite a sizeable hug" at Spats Colombo's live shows. The band also playS the Oireachtas in Killarney on November 4 and the Cabaret Craiceailte on November 26. See www.facebook.com/spatscolomboband. Have you the talent to be Ros na Rún’s next hunk? Page generated in 0.0946 seconds.